We are proud to announce that we’ve received the World Architecture News 2017 Landscape Award for our landscape architectural design of North Bank Bridge Park in Boston, Charlestown, and Cambridge. 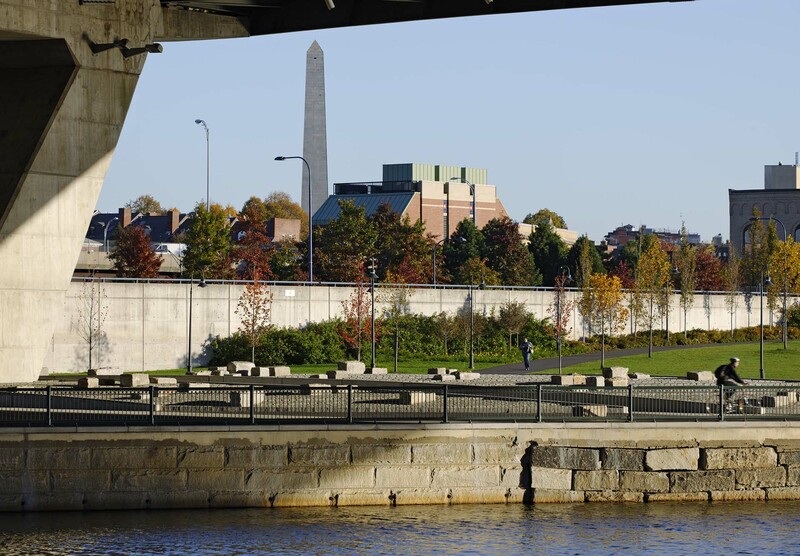 Selected from a shortlist of six international finalists, the award recognizes the North Bank Bridge Park project for reclaiming the post-industrial riverfront area in the vicinity of Boston’s Zakim Bridge and transforming it into a vibrant public park. Principal John Amodeo and Principal Cathy Offenberg led the landscape design team for the North Bank Bridge, the final piece of the waterfront park system in the New Charles River Basin. The project entailed a complex public process, balancing the needs of several public agencies and numerous public constituents. 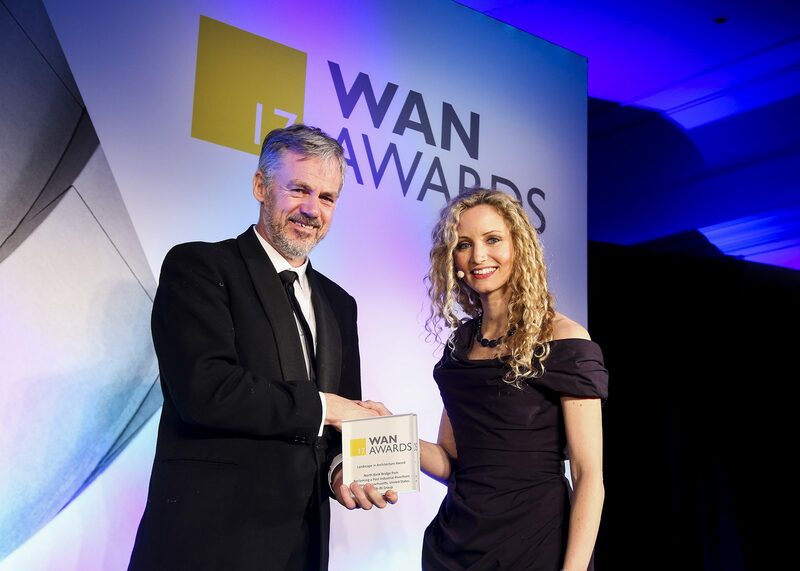 The WAN Awards provide an opportunity for recognition and exposure of design projects on a global platform. Judges use their experience in the sector to assess projects on a variety of factors including originality, innovation, form, function, sustainability and context. 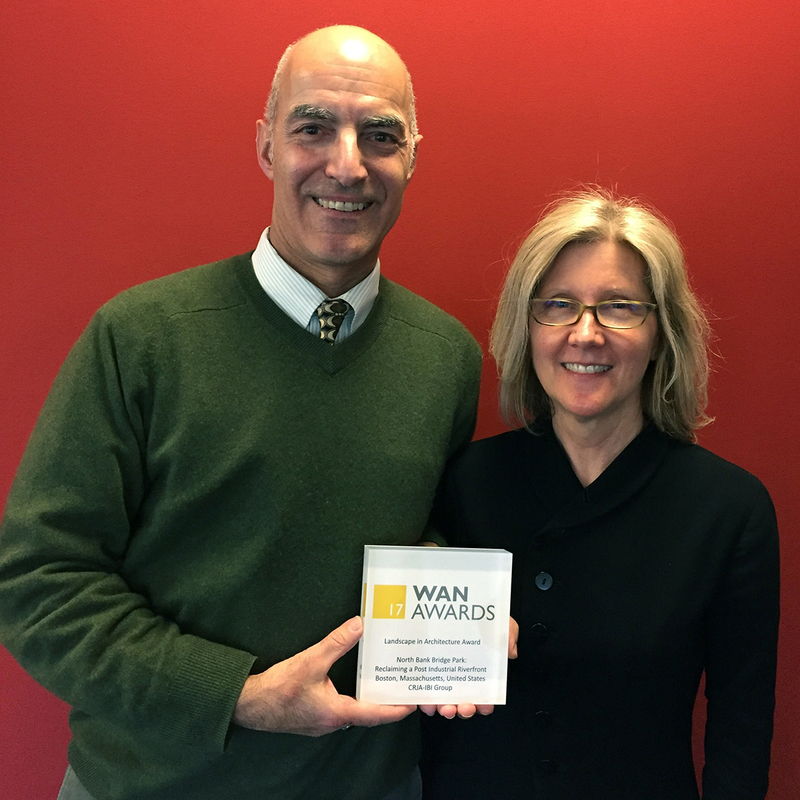 The WAN Landscape Award was established to celebrate and promote the best in landscape architecture from enhancements and small developments to the largest master plans. The North Bank Bridge Park project received top honors in the landscape category for creating a memorable urban plaza in a formerly derelict underbridge space, enriching the community’s experience and providing an uplifting public realm. “[The North Bank Bridge Park is] an interesting way of celebrating this great piece of engineering while opening up new vistas of the city, from what could so easily have remained an unloved and harsh urban landscape,” commented Eliot Postma, a member of the 2017 WAN Landscape Awards jury. Postma is an architect and group leader at Heatherwick Studio in London. Connecting a formerly inaccessible portion of the Charles River, on both the north and south banks, referred to as “The Lost Half Mile,” the North Bank Bridge Park created the first river-edge connection between the Charles River and Boston Harbor, finally fulfilling a century-old vision of Charles Elliot. 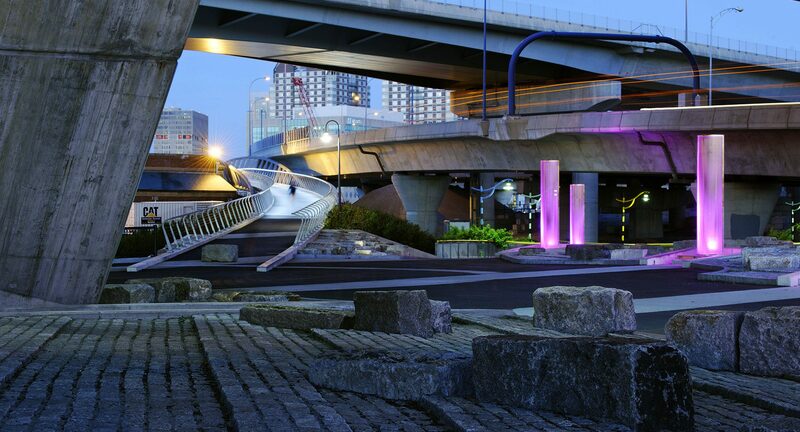 A key feature of the park is the Underbridge Plaza, an unexpected urban outdoor room that borders on the Charles River and uses the Zakim Bridge as its roof. 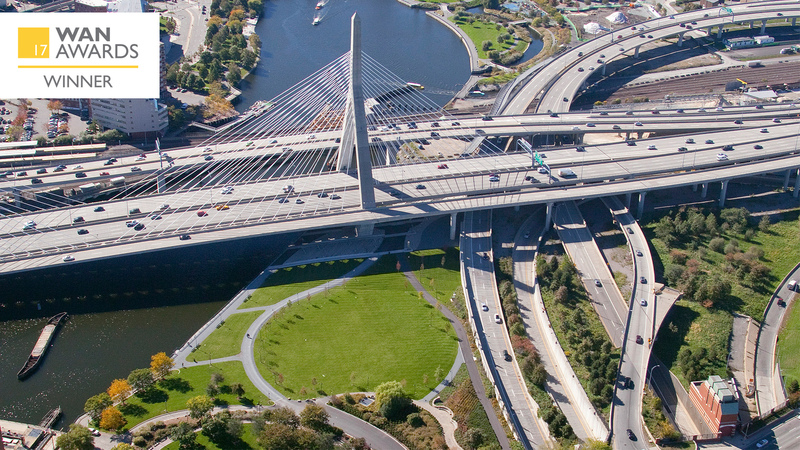 The North Bank Bridge, the project’s sculptural centerpiece, spans a rail corridor and other obstacles to form vital pedestrian and bicycle connections between neighboring Cambridge and Charlestown. 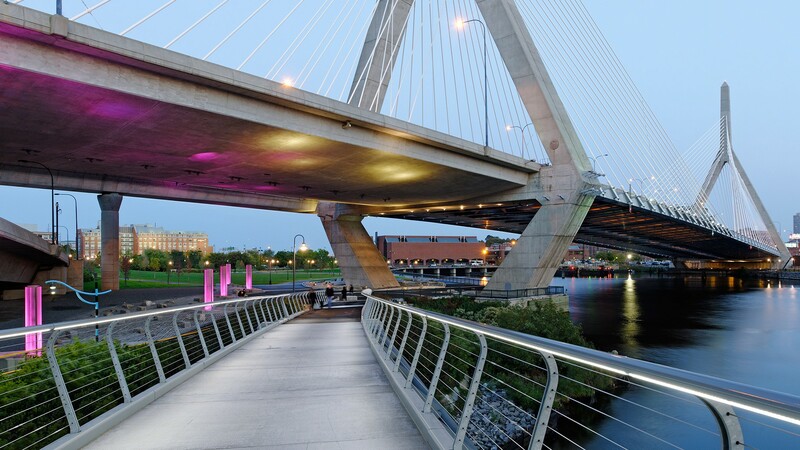 CRJA-IBI Group worked with the bridge designer to develop the bridge’s reverse curved horizontal alignment to create a seamless interface with approaching park pathways, while offering a dramatic view centered on the Zakim Bridge’s north pylon. Part of reclaiming this urban waterfront entailed using rigorous sustainable measures, such as native planting to restore parts of the riverbank and form the east abutment of the North Bank Bridge, the reclaiming of stone seawall blocks and granite cobblestones from other parts of the Central Artery project, and coordinating a complex brownfield reclamation effort. Cobblestones and reclaimed seawall blocks extend the greensward landform into the underbridge environment. A leveling course beneath the guardrail and seawall capstone smooths out the horizontal and vertical variations in the existing seawall, enhancing the esplanade experience. CRJA-IBI Group served as landscape architect and member of the Prime Consultant Joint Venture team of Ammann & Whitney (now The Louis Berger Group), Greenman-Pedersen, Inc., and Stantec. David McKenna, Studio Associate Director in IBI Group’s Liverpool office, accepted the award on our behalf at the award ceremony in London.